Koffee with Karan Episode Three – Arjun and Varun’s Bromance is Boring! 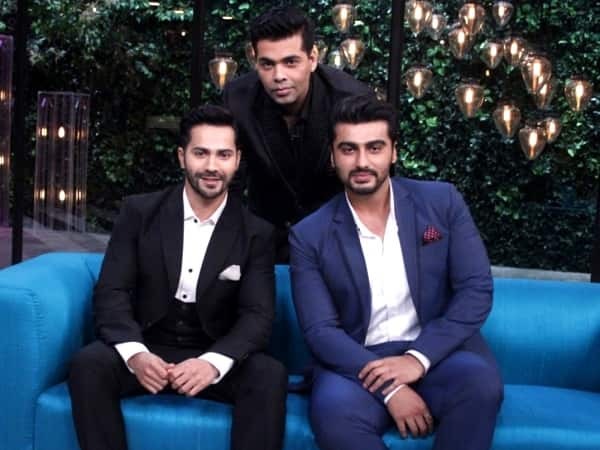 Koffee with Karan was graced by two star kids – Arjun Kapoor and Varun Dhawan in the third episode of the show. It wasn’t too funny to watch but Karan still managed to get out a few secrets. Koffee with Karan Season 5 is all about Karan Johar trying to get out the celebrity guest’s secrets. The latest episode was graced by two star kids who happen to be childhood buddies – Arjun Kapoor and Varun Dhawan. Although, to be honest, when the news came about Arjun and Varun coming together, we weren’t that happy. To some extent, a lot of viewers were waiting to see Ranveer Singh and Arjun’s awesome duo once again. Even Arjun said on the show that, Varun’s under pressure because his last year’s appearance with Ranveer was one of the most remembered episode. Arjun and Varun were way too diplomatic on the show. The show started with Karan’s usual secret spilling questions which both avoided answering. Karan went on to bluntly ask the childhood buddies if their friendship was affected due to the link up stories with Alia Bhatt at a point. Both denied dating her maintaining a clean slate again. Arjun stated that his relationship status is single and that he doesn’t know if he’d be great at commitment at this point. So, after clarifications of Varun and Arjun nor dating Alia, the next question is who was Alia Bhatt dating? To which Varun reveals that Alia was dating a guy from Dubai named Ali. Now, what about Sidharth Malhotra? Well, both act clueless and avoid talking anymore about it. Varun tried avoiding the question before at least agreeing that Natasha Dalal (his rumoured girlfriend) is a close friend and as she is not from the industry, he avoids talking about her. Varun was trying too hard to speak politically correct statements throughout the show. It was more like a rehearsed answer which we have heard from his age actors in chat shows. Talking about his friendship with Ms. Dalal, Varun said that he is doing everything any regular 29-year old would be doing. Okay! Can I just yawn?! There were lame and sick questions about body parts which Star World also chose to mute. The next few minutes passed in discussing Arjun and Varun’s acting classes days. Karan had a segment in which he asked the actors to enact some scenes he would give them. The segment was supposed to be fun but the scene of gay men trying to make a conversation in a pub was too lame to be funny. Varun literally slept on Arjun’s lap when he was told to be more touchy. Even Karan Johar couldn’t stop himself from giggling at what they were doing. Karan also showed a snippet of a short film done by Arjun and Varun during their Bary John’s acting class. Then comes the Rapid-Fire round, which was the most boring part of the show which was not at all expected. However, they both killed Ranveer & Katrina in the marry, hook-up and kill question. We wonder what happened to the lovely friendship of Arjun and Ranveer. And, Katrina Kaif can be a mutual choice because of their love for Salman Khan. Choosing Ranbir to marry and killing Ranveer doesn’t look like a coincidence. Also, not wanting to hook up or marry Katrina is fishy and the reasons are best known to them. Maybe Ranbir Kapoor and Ranveer Singh are the better people to answer these questions. You don’t have to wait that much because they are the next guests on the couch of Koffee with Karan. Arjun Kapoor is also making a guest appearance with their buddies Ranbir and Ranveer. Arjun won the Rapid-Fire round this time as well. Next was the Koffee Quiz which was full of Bollywood questions and Varun won this one. When both were asked at the end to give a signing off speech at the end, Varun stated he was a little diplomatic throughout the show because media twists the said things. Varun also went on to say that he is very happy in his personal life and that is because of a special person. This was cute but we watch Koffee with Karan for Gossips!! Overall, Koffee with Karan Episode Three didn’t live up to our expectations as we always look for more gossips and less diplomacy. However, if we observe keenly, some secrets were still spilled out by the guests during the show without actually saying anything. In the Rapid-Fire round, Arjun always chose the other actress over Sonakshi Sinha. And, Varun was giving Sidharth Malhotra last rank in his preference questions. Well, there’s no smoke without fire.